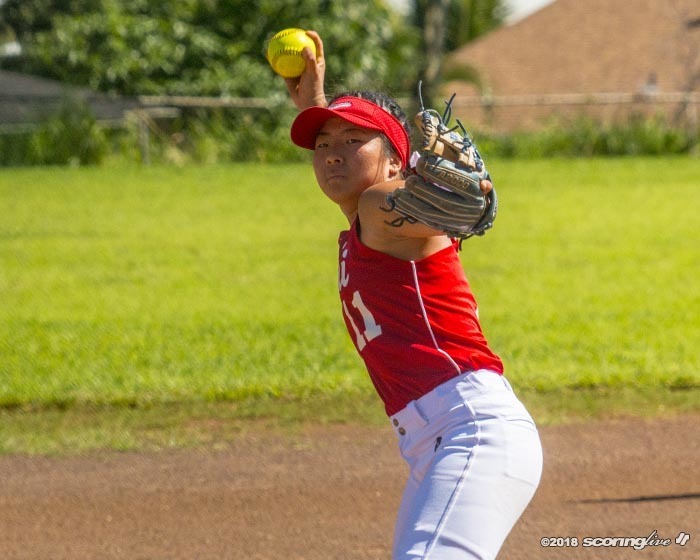 KALANI SOFTBALL'S CHERISE HORITA PITCHED HER SECOND PERFECT GAME OF THE SEASON! PALOLO VALLEY — For the second time this season, Cherise Horita achieved perfection. Horita, a junior pitcher, hurled a perfect game with nine strikeouts to lead Kalani to a 10-0 win over Aiea at Edward Pacheco Field at Palolo Valley District Park Tuesday afternoon. The game was called after Toni-Lynn Ibara's three-run home run in the bottom of the sixth inning due to the mercy rule. The Falcons, one of two remaining undefeated teams in the Oahu Interscholastic Association Division II standings, improved to 6-0 on the season, while Na Alii fell to 5-2 and saw their four-game win streak snapped. Horita faced the minimum 18 batters and did not reach a three-ball count.